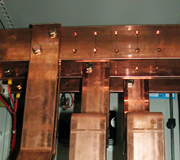 The material composition and cross-sectional size of the busbar determine the maximum amount of current that can be safely carried. 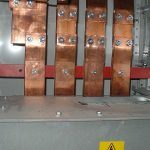 Busbars can have a cross-sectional area of as little as 10 square millimetres (0.016 sq in), but electrical substations may use metal tubes 50 millimetres (2.0 in) in diameter (20 square millimetres (0.031 sq in)) or more as busbars. An aluminum smelter will have very large busbars used to carry tens of thousands of amperes to the electrochemical cells that produce aluminum from molten salts. 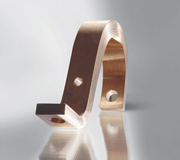 Busbars are produced in a variety of shapes, such as flat strips, solid bars, or rods, and are typically composed of copper, brass, or aluminum as solid or hollow tubes. Some of these shapes allow heat to dissipate more efficiently due to their high surface area to cross-sectional area ratio. 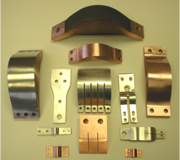 The skin effect makes 50–60 Hz AC busbars more than about 8 millimetres (0.31 in) thickness inefficient, so hollow or flat shapes are prevalent in higher current applications. 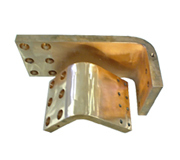 A hollow section also has higher stiffness than a solid rod of equivalent current-carrying capacity, which allows a greater span between busbar supports in outdoor electrical switchyards. 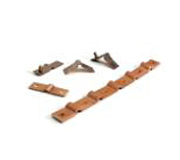 A busbar must be sufficiently rigid to support its own weight, and forces imposed by mechanical vibration and possibly earthquakes, as well as accumulated precipitation in outdoor exposures. In addition, thermal expansion from temperature changes induced by ohmic heating and ambient temperature variations, as well as magnetic forces induced by large currents, must be considered. 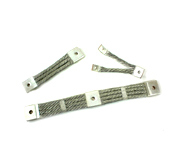 In order to address these concerns, flexible bus bars, typically a sandwich of thin conductor layers, were developed. These require a structural frame or cabinet for their installation. Distribution boards split the electrical supply into separate circuits at one location. 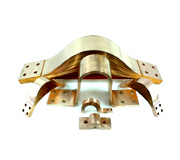 Busways, or bus ducts, are long busbars with a protective cover. Rather than branching from the main supply at one location, they allow new circuits to branch off anywhere along the route of the busway. 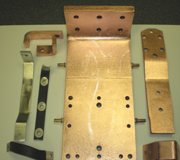 A busbar may either be supported on insulators, or else insulation may completely surround it. 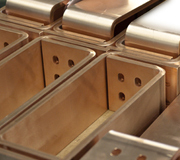 Busbars are protected from accidental contact either by a metal earthed enclosure or by elevation out of normal reach. 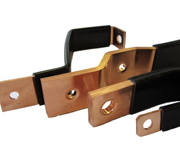 Power neutral busbars may also be insulated because it is not guaranteed that the potential between power neutral and safety grounding is always zero. 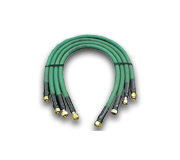 Earthing (safety grounding) busbars are typically bare and bolted directly onto any metal chassis of their enclosure. 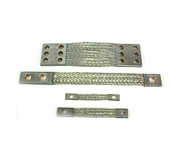 Busbars may be enclosed in a metal housing, in the form of bus duct or busway, segregated-phase bus, or isolated-phase bus.